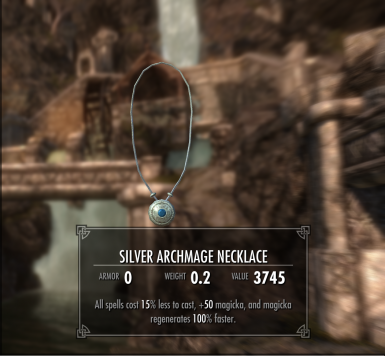 Hi, I was really hyped with this mod because it would easily solve my aesthetic problems while being the arch mage, However I also have Immersive College of Winterhold installed and none of the saves have the necklace. I can understand that these two mods might conflict, is it possible to obtain the necklace via console? Sorry for the late response. You can add the necklace via console. Just find the form ID in SSEEdit or do a search for it in the console too. Is it dis-enchantable as well? Hmm. Well, I went into the Creation Kit and I don't see a way to make it disenchantable. Sorry.